East Africa is renowned for the teeming wildlife that attracts millions of tourists from around the world annually. But lurking in the shadows, the menace of poaching has been growing and in the past two decades has taken on a deadly dimension that has seen not just seen the decimation of wildlife species but also the killing of game rangers who are at the forefront of wildlife conservation. For game rangers around the world, protecting wildlife has become a life-threatening mission since poaching became one of the fastest growing international crimes, especially now it is linked with terrorism and wildlife trophy trafficking. Thousands of rangers around the world face the threat of death daily in the line of duty, from rogue soldiers abetting poaching, rebels in unstable countries, drug and smugglers’ cartels and even from the wild animals they are meant to protect. According to the International Ranger Federation (IRF), an average of 100 game rangers die annually protecting wildlife, with over 1,000 recorded fatalities between 2004 and 2014, a figure that could easily be double that since many developing countries do not keep detailed records. Of the 56 rangers who lost their lives in the line of duty between 2013 and 2014 worldwide, 29 were killed by poachers, according to the 2014 report by IRF, which has been monitoring ranger deaths since 2000. The 2014 death toll reached 102, with poachers and militia responsible for 69 of those deaths. As more deaths are reported every year, the figures represent only the confirmed deaths from 35 countries that voluntarily report to the IRF, and the actual number worldwide could be double or triple that reported. 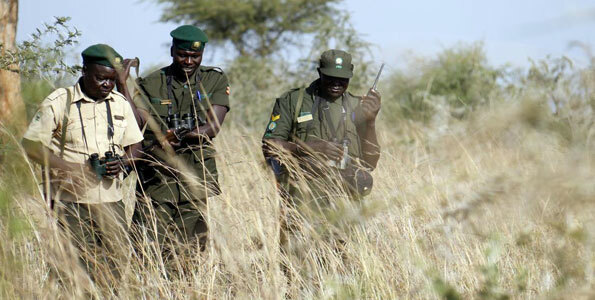 On March 21, 2011, the management of the Kidepo Valley National Park — a pristine conservation area perched in the corner of Uganda’s northeastern border with South Sudan and Kenya in Kaabong district, 700 kilometres from Kampala — received a report that gun shots had been heard in the northern part of the park and rangers were responding to the incident. One of them was Corporal Samuel Loware. “We encountered 16 armed poachers who were already carrying away buffalo meat. In the exchange of gunfire that followed we lost one of our officers, Leopold Masereke. All the poachers escaped, but one who suffered gunshot wounds dropped a G3 rifle with 10 rounds of ammunition,” Loware recalls. Lance Corporal Samuel Okello, 33, told The EastAfrican: “I have encountered poachers several times, but the most dangerous incident happened in July 2012 when we were driving to the northern part of the park in a team of 19 rangers and we came face to face with a group of poachers crossing the main road. “We all jumped out of the truck and took cover, as an exchange of gunfire with the poachers ensued. We lost a UPDF private. I don’t recall his name. We killed two poachers while the rest escaped, but we recovered two guns,” Okello adds. In Uganda, poachers have been known to deliberately start fires in some sections of the parks so that grass while grow there and attract wild animals that they can then kill either for meat or trophy. In November 1994, recalls Corporal Bernard Lotuk, 43, he and other rangers encountered a poacher burning grass in the eastern part of Kidepo. “As we were making an extended field patrol after seeing the smoke, the poacher fired a bullet at an oribi antelope and killed it. We zeroed in and arrested him. He had an AK-47 rifle with 10 rounds of ammunition. We handed him over to the police for prosecution,” he says. To underscore the price that game rangers at Kidepo pay for protecting wildlife, the park has a cemetery containing six graves of rangers killed on duty on October 18, 1959. The Hero’s Cemetery is the final resting place of rangers William Warija, Talip Atia and four other people. According to the International Union for the Conservation of Nature (IUCN), poaching has become sophisticated. It is no longer subsistence poaching, the kind where local families kill wildlife for bushmeat or to smuggle out illegal wildlife products for a little cash. Poaching has evolved into an international crime characterised by highly organised networks. The poachers use helicopters, night-vision equipment, veterinary tranquilisers and lethal arms fitted with silencers to kill prized animals such as elephants for their tusks and rhino for their horns. Given this shift, poaching has escalated at an alarming rate in the past decade, despite the measures put in place to support conservation efforts, IUCN adds. According to Lotuk, who was recruited as a ranger in 1993 under the Uganda National Parks (now renamed UWA) there are different types of poachers. Subsistence poachers who use snares and poisoned arrows or wheel traps, and commercial poachers who use guns. “The most dangerous ones are the South Sudanese poachers, who are always armed. When you encounter armed poachers it is a life-or-death situation. You don’t ask, ‘Who are you?’ We just shoot. We have a standing order of ‘shoot to kill’ for armed poachers. For the ‘local’ poachers who use traps, we chase them to their homes, arrest and prosecute them,” Lotuk says. “Because of our history here in Kidepo, the poachers know that rangers in this park are tough fighters,” Loware chips in. There have also been incidents in Kidepo where poachers have been killed by wounded buffaloes entangled in the poachers’ snares. According to IRF, almost 60 per cent of all rangers killed in 2014 were from Asia, with the majority from India. India, Thailand, Kenya and the DR Congo have seen the sharpest increase in ranger deaths caused by poachers in recent years. Areas rich in elephants, rhinos, sandalwood, rosewood and other valuable resources are most affected. IUCN observes that since many rangers are poorly paid, the temptation to give in to traffickers is strong. According to the International Fund for Animal Welfare, at one time in China, ivory sold for about $1,700 per kilogramme and one endangered hyacinth macaw could fetch around $10,000. Assuming a ranger earns $50 a month, an average 10-kilo tusk comes in at $17,000, or 340 times the ranger’s monthly salary. Loware does not rule out disgruntled former rangers who were discharged from UWA working with poachers for quick money. Rangers in Uganda are recruited by UWA and undergo a six-month para-military training course . UWA currently employs approximately 1,500 rangers to cover about 71,000 square kilometres of protected area. “Of course this number is small compared with the IUCN standard for savanna areas, which is one ranger per every six square kilometres. To reach this standard, we need about 10,000 rangers. Still, the 1,500 rangers distributed across all protected areas are doing a good job at controlling poaching and other illegal activities in and around those areas,” Mr Tumwesigye says. At Kidepo, the rangers’ daily field work involves research, collecting ecological data on animal distribution and bird species, weather and protecting and guiding visitors to the park on game drives and nature walks. According to IUCN, some parks have too few vehicles, making regular and extensive patrols difficult. Adequate equipment and training in many cases can help reduce the risks to rangers, who often happen to be the only breadwinners for their families. The IRF and its charity arm, the Thin Green Line Foundation, offer equipment and training to rangers and support the families of rangers who have died in the line of duty, helping to pay for healthcare, education and employment for their widows and children. In 2007, IRF introduced World Ranger Day, which is marked on July 31, in remembrance of rangers who died in the line of duty. “Our biggest challenge is low pay,” Loware laments. “Field gear like binoculars, gumboots, cameras, and raincoats that a game ranger is supposed to have are not readily available. But we are still expected to be on patrol duty even during the rainy season even if we don’t we have raincoats,” he added. Firefighting gear is unheard of and in case of bush fires, they use tree branches to put them out. Rangers get medical insurance that covers one spouse and four biological children. This cover is issued under the Workers Compensation Act. Okello says UWA needs to conduct trainings in modern wildlife protection and field tactics; Mr Tumwesigye says this is planned in phases. A number of rangers are already receiving specialised training in combat, intelligence, investigations as well as evidence and scene-of-crime management. More training programmes are planned with the support of conservation partners and stakeholders, including other security agencies. According to IUCN, rangers in Uganda, DR Congo and Rwanda have been directly responsible for an increase in the number of mountain gorillas, risking their lives to ensure the survival of this critically endangered species. Community Maasai Rangers in Kenya have helped increase the local lion population on community lands from just six individuals to over 70. According to IRF and IUCN, rangers are the last frontier between species and ecosystems and poachers.